Khazad-Dûm - Khazad-Dûm was the Dwarvish name for the Misty Mountains. The bridge across the great chasm in Moria was one of the most famous landmarks and the place where Gandalf battled the Balrog. "'Over the bridge!' cried Gandalf, recalling his strength. 'Fly! This foe is beyond any of you. I must hold the narrow way. Fly! Aragorn and Boromir did not heed the command, but still held their ground, side by side, behind Gandalf at the far end of the bridge. The others halted just within the doorway at the hall's end, and turned, unable to leave their leader to face the enemy alone. The Balrog reached the bridge. Gandalf stood in the middle of the span, leaning on the staff in his left hand, but in his other hand Glamdring gleamed, cold and white. His enemy halted again, facing him, and the shadow about it reached out like two vast wings. It raised the whip, and the throngs whined and cracked. Fire came from its nostrils. But Gandalf stood firm. 'You cannot pass,' he said. The orcs stood still, and a dead silence fell. 'I am a servant of the Secret Fire, wielder of the flame of Anor. You cannot pass. The dark fire will not avail you, flame of Udûn. Go back to the Shadow! You cannot pass.' 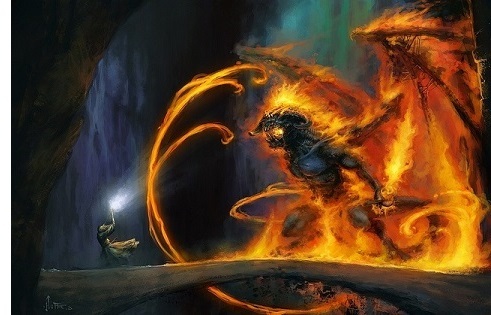 The Balrog made no answer. The fire in it seemed to die, but the darkness grew. It stepped forward slowly on to the bridge, and suddenly it drew itself up to a great height, and its wings were spread from wall to wall; but still Gandalf could be seen, glimmering in the gloom; he seemed small, and altogether alone: grey and bent, like a wizened tree before the onset of a storm. From out of the shadow a red sword leaped flaming. Glamdring glittered white in answer. There was a ringing clash and a stab of white fire.